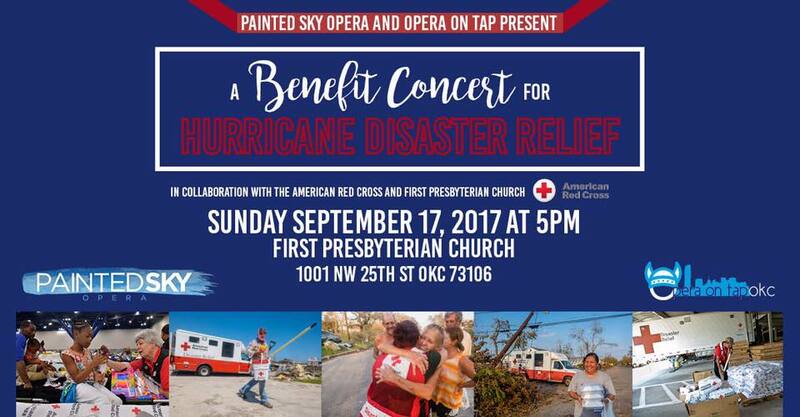 Help Painted Sky Opera and our friends at Opera On Tap OKC help raise money for the Red Cross and victims of Hurricane Harvey and Irma by attending a benefit concert on September 17 at 5 pm at First Presbyterian Church on 1001 NW 25th Street in Oklahoma City. Our goal is $10,000 and 100% of all funds raised will go to the Red Cross. Let us know you are coming by responding to the Facebook Event. We are accepting a freewill donation for attendance at the concert, which will feature inspiring songs from the operatic and musical theatre repertoire sung by members of our cast of Tosca and singers from Opera On Tap OKC. Can't go to the concert but still want to contribute? Donate to our hurricane disaster relief fund through PayPal. All donations through this link will be tagged specifically for the Red Cross.